Sciblogs | Monkey business, or is my uncle also my Dad? For a short while I had a temporary gravatar as a infant pygmy marmoset, clutching a human finger. I’ve revised it to a posterised image of me. It’s not as if I was convincing anyone I was as cute as the baby marmoset… While reading about these cute little guys (and gals), I learnt that family relations for them really is monkey business. Pygmy marmosets are the world’s smallest living primates. As a primate, he (she?) is one of us! To give yourself a better idea of the size of a pygmy marmoset’s body, give your computer screen that universally understood single finger gesture. You know the one I mean. 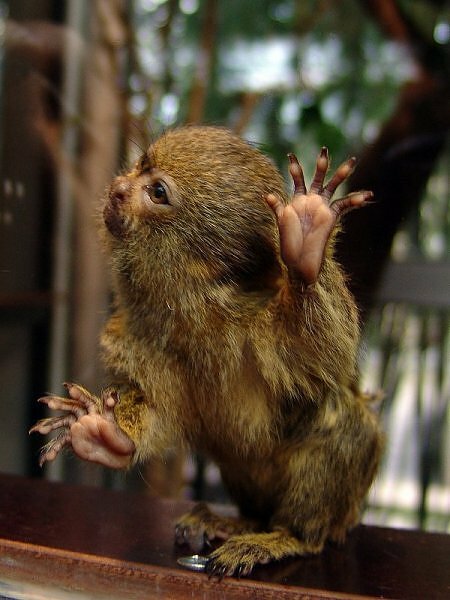 The smaller species of pygmy marmosets have bodies a little bigger than that extended finger, about 13cm. Given that they’re tiny, furry and cute, it hardly surprising that there is plenty of photographs of them on-line. (I’ve listed a few below.) Sharp readers will spot that they lack opposable thumbs and have claws rather than fingernails. One fact struck me while learning a little about pygmy marmosets: according to one research paper pygmy marmosets the only primate known to have germline chimerism! This has the startling effect that occasionally a male marmoset can–in a sense–have a mixture of their own and their brother’s sperm, and pass the genes of it’s brother to it’s children. Or put another way, a kid’s uncle could also be it’s father, in a manner of speaking. Women don’t need to worry that they’ve been left out just yet. The same may be true of females, but wasn’t observed in the research study. In humans, all the cells in our body come from a single fertilised egg; they all from the same genetic stock. In a chimera, the cells in the body are a mixture coming from more than one embryo. Twins are relatively rare in humans. Part of the reason chimeras are common in marmosets is that marmoset mothers usually give birth to fraternal twins, non-identical twins from two different egg cells fertilised by two different sperm cells. Chimeras are rare in mammals and when they occur it is usually only the blood cells that are a mixture from the two embryos. One example of what can happen is for early embryos from twins to share or partially share their placenta, so that the developing blood systems of the two zygotes are able to swop blood cells, so that when the zygotes go on to form separate infants, they have a mixture of blood cells. Only the blood cells get mixed, all the other kinds of cells are all from their particular egg. So, if you looked at the different cells of a chimeric monkey, you would expect to find the blood cells to be a mixture of cells from each twin, but all the other kinds of cells to be from the same genetic stock. Orti’s research group in the University of Nebraska had clues that this might not be the case for pygmy marmosets and checked. They found that in marmosets lots of other kinds of cells from twins were a mixture, including germ cells, the cells that give rise to sperm (or eggs). Zygotes with a mixture of germ cells will grow to have sperm (or eggs) that are a mixture of those derived from germ cells from their embryo and from germ cells from their twin. When these chimeric children, in turn, have children, they could pass on their genes, or the genes of their twin, depending on if the germ cells the formed the sperm (or egg) that the made the child’s zygote originally came from their embyro, or their twin’s embryo. I’d explain the use of microsatellites in this study, but this would make for a very long article. Microsatellites are small, highly variable regions of DNA that can be used to “fingerprint” cells or organisms, like they do in those CSI-type TV programs to match the criminal to the crime scene. Here they’ve been used to check if particular cell types have the same genetics, or are a mixture. Towards the completion of this article I realised that this story was well-covered by some parts of the media and in blogs at the time the paper was published (2007). It was too much fun to stop, so here it is! 2. Infant pygmy marmosets are incredibly cute, their photographs are all over the WWW. I’d include one of the cuter ones in this article, but I’m unsure of it’s copyright status (I’ve tracked it down to the Everland Zoo in Korea, via the Zooborns blog, but the trail runs cold at that point). Other particularly cute photos include two infant marmosets for sale and in Jeffrey Gordon’s article Cuter Sapsuckers. 3. Nierhardt, Mareen Pygmy Marmosets. (Link to PDF file of article at the Rare Species Conservatory Foundation website.) This article contains many interesting details about these animals, especially about hand-raising orphans.